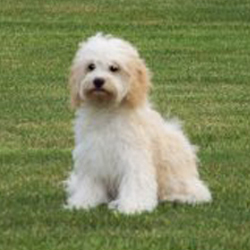 Cockabichon is a breed produced by the crossing of Cocker Spaniel and a Bichon Frise. They are famous as designer breed dogs and becoming immensely popular. It has a mixture of characteristics of both its parents. As a result of which it is very affectionate and outgoing. They get along with children and other pets quite easily. Due to the rarity of the breed, it does not suffer from any dog disease. It may live upto 10 years.